Order Fulfillment: To Outsource or Not to Outsource? That is the Question! As our team prepares for the Electronic Retailing Association’s Great Ideas Summit (February 26-28 in Miami), we will be meeting with several companies wrestling with the question of whether to outsource order fulfillment, customer care and value-added services like returns or kitting and assembly. You probably have already considered outsourcing, but what answers should you be seeking out? Let’s take a look at these questions category by category to help explain. Quantifiable Cost – Outsourced fulfillment provides a mostly variable cost component to your campaign. If you sell, you ship. If you ship, you incur known and predictable costs. As you’re building campaign financials, outsourcing allows for a tighter budget. If you predict activity, the fulfillment cost can be projected accurately. Compare this to doing fulfillment on your own. Try to think of all the cost factors you will be budgeting for: warehouse space, taxes, utilities and labor. It is very likely you won’t anticipate every single factor that needs to be included. Even if you can, you don’t know how to predict their variability over time; which makes your whole financial plan risky. With outsourcing, you have negotiated a cost structure with your fulfillment center, allowing you to predict a transaction unit cost. Expertise – When hiring a 3pl provider these days, experience certainly matters! Fulfillment is a lot more complicated than most people think. To do it accurately and effectively, you need specialized system, labor, management and expertise. Even marketers with their own distribution centers fulfilling B2B orders should think twice before trying to utilize these resources for consumer-direct fulfillment. They’re very different and the landscape is very dynamic. Carriers and freight programs are ever-changing, technology is evolving and consumer expectations are becoming more demanding. An experienced fulfillment provider is on top of these changes and can shift you into more advantageous programs quickly. Outsourced fulfillment centers often have years of experience across many product lines, campaigns and industries. All that accumulated knowledge is applied for the benefit of each client. Finally, every successful fulfillment center has mastered labor management. Would you like to be an expert in this area? Or would you rather create, market and sell your products? Lower costs – Beyond the discussion of fixed vs. variable costs, outsourcing your fulfillment will most certainly provide lower overall costs. First, you avoid making an investment in real estate. 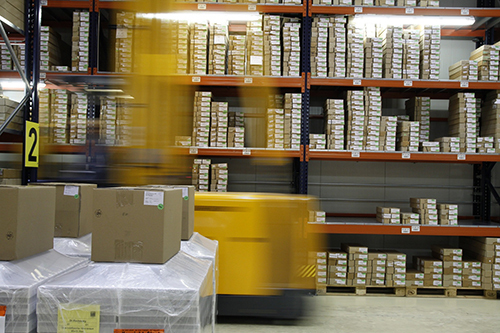 Second, outsourced fulfillment centers are more efficient with labor, lowering your unit cost. Third, your fulfillment center obtains better shipping rates than you can achieve on your own, meaning you can keep your costs to your customers lower, and/or you can improve your profitability. An outsourced fulfillment center will have the ability to scale up or down to your changing needs. We often hear small and/or start-up companies worry about set-up fees or monthly minimums. There is a perception that these costs can be avoided if they do it themselves. However, these costs are a negligible portion of any start-up. If you are going to be successful selling direct-to-consumer, you need to think long term. An investment of a few thousand dollars to set-up with the right fulfillment center is worth its weight in gold. Location – As we’ve talked about before, Fulfillment location plays a major role in reducing transit time (and saving on your shipping costs in the process!). If you handle your own fulfillment, you are stuck with your own geographical location. If most of your sales will be in your immediate area, then being located close to your customers is a benefit. But if your customers are located across the country, or scattered around the country, you can choose your fulfillment partner based on geography. Depth-of-service options – Many fulfillment centers offer a suite of services, including fulfillment, order management, customer service, backend shopping cart and reverse logistics. What you need to determine are the fulfillment services necessary for your business and if you’d like to bundle those together with one vendor. You may have needs for several of these functions, and you can create your own package that is provided by one supplier, simplifying your management efforts. In summary, as you do your research, be sure to take the time to search out, meet and discuss business with each fulfillment center you are considering. You will be adding a great strategic partner to your team that will help ensure your investment in marketing your product will be a big success!